Immune thrombocytopenia (ITP) is an autoimmune disease characterized by increased platelet destruction and reduced platelet production caused primarily by IgG antiplatelet autoantibodies, which mainly target platelet membrane glycoproteins (GPs), including GPIIb/IIIa and GPIb/IX. GPIIb/IIIa-reactive CD4+ T cells play a central role in the pathogenic process by triggering and maintaining antiplatelet autoantibodies. The mechanism for ongoing antiplatelet antibody production is explained by a “pathogenic loop” model consisting of macrophages in the reticuloendothelial system, GPIIb/IIIa-reactive CD4+ T cells, and B cells producing antiplatelet antibodies. Among T helper (Th) cell subsets, Th1 and Th17 cells as well as newly identified T follicular helper (Tfh) cells, which support B cell maturation and differentiation within the germinal center, are actively involved in antiplatelet antibody production. Finally, platelet-reactive CD8+ cytotoxic T cells directly induce lysis and apoptosis of circulating platelets as well as megakaryocytes. On the other hand, CD4+ regulatory T cells (Tregs), which contribute to maintenance of peripheral immune tolerance, are defective in patients with ITP, through decreased numbers and impaired function of Tregs. In fact, mice lacking Foxp3 Tregs spontaneously develop chronic thrombocytopenia mediated through the production of IgG antiplatelet autoantibodies. Further studies evaluating mechanisms for T-cell dysregulation are useful in elucidating the pathogenesis of ITP and in developing novel treatment strategies. 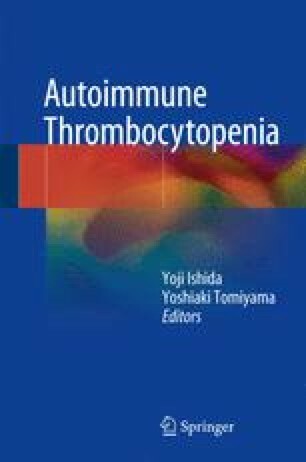 We dedicate this chapter to the late Tetsuya Nishimoto, who had contributed to elucidation of autoimmune mechanisms of ITP.